I have seen these in use and they are super cool. And for the record we used to do the ice luge at our college parties and it has made it’s way into the weddings of several friends. It gets drinks super cold and you always end up with someone with there lips stuck to the delivery end. Thanks for taking the time to comment! You guys have been so busy over on the Booze Dancing blog – I’m flattered you had time to stop by! Thanks for sharing the Macallan video – but I have to say that seems a bit intense for me (though I guess I also wouldn’t have the dramatically intense music playing in the background so that may mellow the experience out a bit). Though I do think that would definitely take up too much counter space, especially in my tiny NYC apartment. 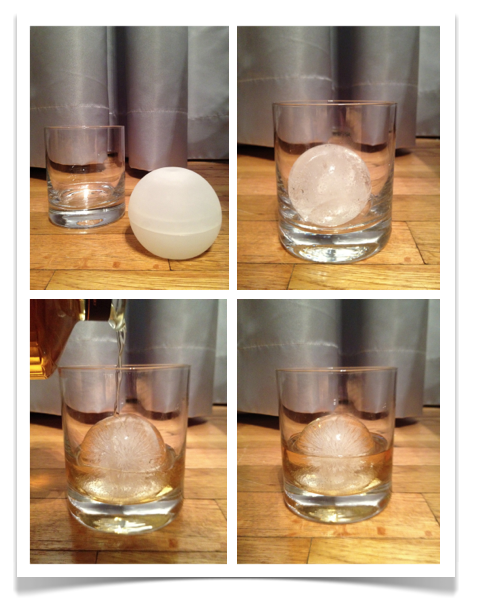 I was really intrigued and captivated by the video – if not just because it seemed like quite an ordeal for an ice ball … isn’t it just easier to fill a mold that’s in the shape of a ball? Thank you for sharing AND for your thoughts / experiences with the ice luge! I hadn’t thought about freezing ones lips to it though … that’s not cool. If you don’t have the “dramatically intense music” playing on a continuous loop in your apartment how can you properly enjoy your Whiskeys? LOL! This is the ice ball thing taken to extremes. The only thing more extreme is those bartenders in Japan that chisel ice balls to order for each customer but I guess if there in no room an ice ball machine in your apartment adding a personal bartender is out of the question. And for the record freezing one’s lips to an ice luge is not pleasant for the person it happens to (my college roommate) but makes for an excellent blackmail picture should that person become an elected official. If only we had smart phones in college I would have video too!! Ha! I think Macallan should offer that soundtrack as a special holiday gift box option. I’m just saying … I think we’re on to something here. On the subject of personal Japanese barmen, I think they may be easier to have in the apartment as they can move themselves out of the way (now you’re beginning to understand the depth of my laziness!). The ice machine is far to complicated for me because I would have to move it every time, vs a person who’s in charge of his own placement in a room … I’m going to ponder this a bit more. Then win the lottery. Then buy a bigger place. Then hire a bartender…. and perhaps an ice machine. hmmm. When I was in NYC for our annual Anniversary weekend, I had a drink in the hotel bar (The Royalton) that was served over crystal clear ice cubes. I never really payed much attention to ice clarity, but for whatever reason, I was amazed at how great the drink (a Vieux Carre) looked in the glass. Although Mrs. G-LO was not at all interested in my beverage, she too was dazzled by the ice. It almost makes it worthwhile to pay $15+ for a drink. Almost. Ha! I hear you, G-LO. $15 hurts. But nice that they went to the extra trouble of giving you fancier rocks and clearly it left an impression! For a similar effect at home, you can use boiled water, distilled water or water that has previously been frozen in your ice mold to create perfectly clear ice. Hope you and Mrs. G-LO are having a great start to the New Year! Thanks for your comments – always love hearing from you! And as far as the comments go, I love the banter. Makes blogging fun! Welcome back! 😀 I’m with you and Wookie, personal barman please, STAT! At least the nice hotels should give us such an option. GREAT ideas!! As I transition from cheap liquor at a dive bar to one who appreciates a great spirit in great company, I was wOndeeing how to avoid the weird old ice in the freezer taste as it melts in my glass. Perfect solutions!!!! Great to see you back in the bloggosphere! Thanks for your comment! 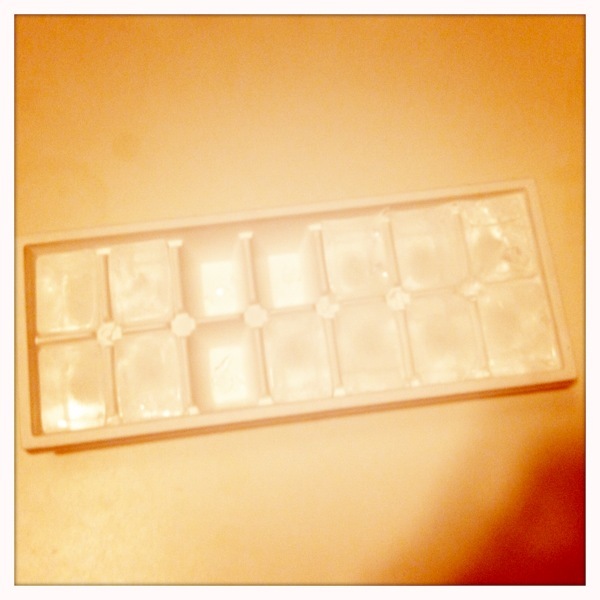 And yes, buying new ice trays does make one get to the depths of the ice box and clean out those old trays! These ones are nice because they allow me to use only one for myself and keep the others in storage until I know that I may be drinking with friends and then I can break em out. A set of 4 for 10 bucks aint half bad, but they dont work perfectly. One thing I did find pretty cool was the idea of putting mint leaves in the ice ball for mint juleps. Haven’t tried it yet, but seems like an interesting idea. Thanks for visiting and taking the time to comment and share! I have to say, I love this set and wish I had seen it before! I agree with you, 4 for $10 seems much more reasonable than what I paid and eliminate the need to wait 6-8 hours for each ball of ice. I’m totally going to experiment with the different herbs in the ice mold. I bet rosemary would be a good one too. Thanks again – glad to have you here! Thank you for featuring our product on your blog. We have featured your blog on our Facebook page. It’s a great product that I’ve really been enjoying. Thanks for the re-post of my article. Great clip! Thanks for your interest and for your comment! It’s always great to hear from the amazing people at Catoctin Creek! I’m actually serving my favorite rye (your Roundstone Rye!) at a tasting this evening where I’ll be comparing the “big boys” to the craft producers. Every time I go down to Maryland, I bring back 2 bottles (at least). I can’t get enough! Let me know which ice mold you decide on – I’ll be curious to see which style you choose! Thanks again for stopping by and sharing your thoughts, Emily. You are currently reading Ice Matters at The Whisky Woman.